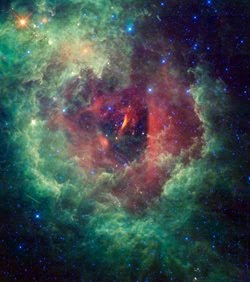 The NASA 's Wide-field Infrared Explorer (WISE) has captured a beautiful pic of a flower shaped nebula (NGC 2237). Nebula NGC 2237 cannot be viewed with our naked eyes but at the center of flower there is nebula NGC 2244 which is made up of cluster of young stars and it can be viewed with the help of a good telescope. NGC 2237 is 4,500 to 5,000 light-years away from our galaxy. Have you ever given a thought that how our Universe came into be? Our Universe was created in an extremely hot and dense state which expanded at a rapid state and then cooled and it is expanding even now today.The fact is interesting isn't it? When our Universe came into existence there was NOTHING at all and Big Bang theory gives an explanation to this. Big Bang theory has been developed by taking theoretical assumptions and observations together by George Lemaitre in 1927 by taking into consideration Albert Einstein's equations of general relativity and proposed and this model was being called "explosion" of a "primeval atom" which later came to be known as Big Bang theory. 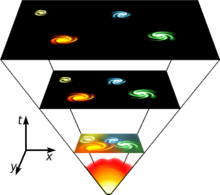 In the year 1929 Hubble suggested that the Universe was expanding, contracting the infinite and is changing the "static universe" theory as proposed by Einstein. In "static universe" theory Einstein explained that our Universe is neither expanding nor it is contracting. According to Big Bang theory after a long period of time the dense matter due to gravitational pull formed stars, galaxies, planets and other heavenly bodies which we find today. Universe is in the form of dark energy today and near about 72% of the energy of Universe is in this form. The most common misconception about Big Bang is that we assume that there was an explosion in the Universe but the experts say that there is an "expansion" and due to this "expansion" things in Universe are moving away from us. There is no evidence of Big Bang theory as there is no explanation to the concept of what could have caused "Big Bang". Big Bang theory gives no explanation to the existence of God. It is being believed that the Universe is a super natural creation by God. It gives no explanation to the fact whether God created Universe. There was an excellent show of Perseids meteor shower on Thursday night along with thin crescent Moon with Venus, Mars and Saturn in the west-southwestern sky just after sunset. Many observers have shared their sightings on Twitter. The Perseids meteor shower is witnessed every year in the second week of August. 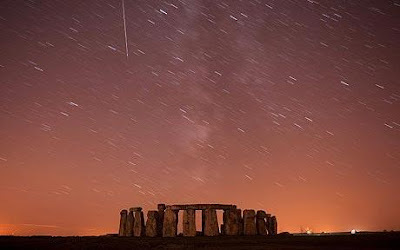 Perseids meteor shower was expected to be seen in India too but unforunately due to bad weather which included cloudy skies and showers only few Perseids meteor were seen by few star gazers between 12:30 hrs and 0200 hrs. Were you able to see the yearly Perseids meteor shower? If yes, then please do share. 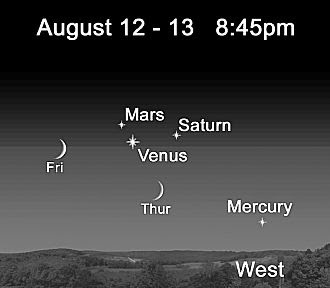 If you happen to be a star gazer then be prepared to see the yearly meteor shower of Perseids and you can also see a young Moon along with Venus, Mars and Saturn in the west-southwestern sky just after sunset. You can enjoy the best Perseids meteor shower on Thursday night till Friday dawn where if you are lucky and have clear sky you can watch 50 to 60 meteors per hour. It will be a beauty to watch those meteor shower with thin crescent Moon. Scientists with the help of camera on NASA's Mars Odyssey spacecraft constructed a map using 21,000 images Thermal Emission Imaging System. You can just log into jmars and have a look yourself. You can zoom around the images of Mars and it looks really great.The images will be used as a research work on Mars for coming years too.